A charming rogue cut from the same cloth as Robert Mitchum, American engineer Dan Courtney is learning fast that it takes more than a little charm to lay the groundwork for a railroad. Particularly when the plan is to build it across some of the roughest and most dangerous territory on earth. Courtney’s been hired to survey the land that would link up the Uganda Railway to the Anglo-Egyptian railroad. Running through desert, jungle and mountains, this is one line - and story - with more twists and turns than the New York City subway system. Diamond smugglers. A fearsome native tribe. A beautiful young American woman . . . and a man determined to kill her. Put them all together and you’ve got a world where All Frontiers Are Jealous. It’s up to Courtney to tame those frontiers - take on the tribe, save the woman, and save the future of the railroad . . . before his blood ends up on the tracks. L. Ron Hubbard based this story on the real-life history of the countless harrowing attempts in the late 19th and early 20th century to link up the two railroads. An experienced civil engineer and surveyor himself, Hubbard had worked in rough and dangerous terrain as part of the West Indies Mineralogical Expedition. 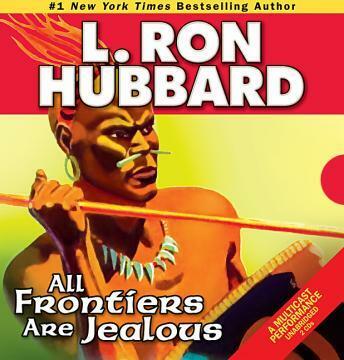 All Frontiers Are Jealous may be a work of fiction, but as far as Hubbard was concerned, in his own life, the adventure couldn’t have been more real.